On USA Football: Coaching Is Teaching. A philosophy to build upon. This week’s USA Football post shares a philosophy that I have based my coaching upon. I share some thoughts on how to put that philosophy into action. Before I became a head coach, I started to organize my thoughts and beliefs to develop my own coaching philosophy. Rather than recreate the wheel, I used my research and adapted the beliefs of great coaches that meshed with mine. One of the philosophies I included in my coaches manual was something that Joe Paterno wrote. I review and update my coaches manual every year, even though I am not a head coach at the moment. Here is my coaching philosophy as well as my notes interjected in italics on exactly what a coach should do to help himself succeed in his job…read more. 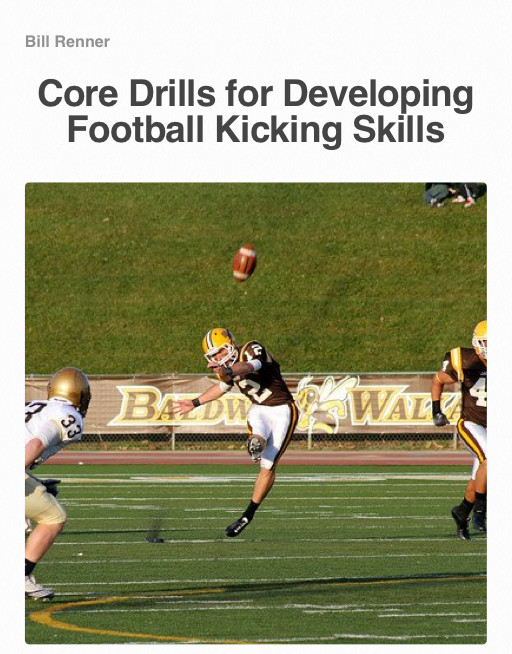 Bill Renner has released an interactive book for the iPad and Mac titled Core Drills for Developing Football Kicking Skills. He shares his years of expertise and boils it down to some simple drills and techniques to help a coach develop a kicker now, or for a kicker to develop on his own. He provides a method for understanding ball flight and what it tells the kicker about his technique, as well as prescribing the adjustments to fix any issues. Why should you get this interactive book? Check out Renner’s credentials below. He’s taken his sought-after-expertise and presented it in a simple to understand format. Get it here. Bill Renner is recognized around the country for his expertise in kicking and punting. Renner played two years in the NFL as a punter for the Green Bay Packers and has worked as a kicking consultant to run kicking camps or consult for John Mackovic, Texas, Nick Saban, LSU and Michigan State, Lou Holtz, South Carolina, Frank Beamer, Virginia Tech, Al Groh, Virginia, Lou Tepper, Illinois, Lloyd Carr, Michigan, John Harbaugh, Philadelphia Eagles, Greg McMahon, New Orleans Saints, Scott Cohen, New York Jets. Renner now coaches high school football in North Carolina. His last two kickers at West Springfield have gone on to full-scholarships to NC State, Josh Czjakowski, and West Virginia, Tyler Bitancurt. In addition, his former West Springfield punter started at Penn State for four years on scholarship and is currently punting for Green Bay Packers, Jeremy Kapinos. Renner has coached or worked with 6 current NFL punters: Steve Weatherford, Jaguars; Sam Koch, Ravens; Kyle Larson, Bengals, Glenn Pakulak, Saints, Brett Kern, Broncos; Jeremy Kapinos, Packers. Renner has put his kicking drills at your finger tips, and shares them in a very dynamic format. Your first scrimmage – Did you pass the test? For most high schools, this weekend presented the first test for your team. You may have seen some bright spots in your scrimmage, or you may have been left with some concerns. The next week will be big in how you either take the next step and build on your momentum, or regroup and find areas in which to improve so that your next scrimmage puts you right on track for where you want to be going into your first regular season game. Dan Gonzalez has put together an outstanding resource that will help a team that is on the right track propel themselves further, and for the struggling team, it can provide clarity for exactly what you can do right now to set things straight. The Need for Change is not a resource that shares concepts, rather it provides opportunities to think about how you are organizing your offense for success, how you take responsibility for the success of your players by serving them, how to create practice drills that get you more bang for your buck, and how to stay on the cutting edge by really being focused on your game planning and preparation. Each chapter contains information and ideas that you can utilize right now. It includes over an hour of video. The interactive book format is available for the iPad and Mac. (These are the only devices that currently can handle this platform). Get it here. Gonzalez explains his axioms in detail in this chapter. Learn how Gonzalez’s axioms get the defense to play into your hands and tax the defense mentally. What any coach can pull out right now to help his offense are bulleted below. Organize your offense so that it attacks all areas of the field. Always be in a good play by organizing play structures into packages to give every play a explosive possibility. Use personnel, shifting, and motioning. Get to the third man in the progression to open up big plays with the third fix. Create big plays and control the clock. Limit the defense’s ability to disguise. The last chapter, “Stay on the Cutting Edge” provides some great thoughts for any offensive coordinator. Gonzalez explains the importance of being organized in thinking about distribution of plays and key factors in becoming a top producing offense. He emphasizes carrying the appropriate amount of offense and how to think about what to carry in terms of play calls. He shares his model and thought process. While your system may be fundamentally different than Dan’s in terms of how it attacks, the thought process can be applied to any offensive system. There is much, much more that Gonzalez puts on the table in terms of how a great offensive coach thinks and plans. This is a resource that is quickly and easily read because of the dynamic format used to produce it. It’s a combination of short, yet meaningful spans of text, and video screencasts in which Gonzalez shares and illustrates the points he writes about in the text. This is part one of four in Gonzalez’s series, “Coaching Concepts: Developing an Offensive System.” Part 1 The Need for Change was designed to make an impact for coaches right now at this time of the year. Follow Dan Gonzalez on twitter @Dan_Gonzalez16 and read his blog here. Not many offensive resources give you information that can be applied immediately. Most take some work and problem solving to be able to fit the idea within your system. If you have been exposed to the materials Dan Gonzalez has created in his first two books, you know he is innovative and gives all the details you need to implement his system. What he has created in his interactive book are tools that are easily applied to your offense. His new interactive book is Coaching Concepts: Developing an Offensive System Part 1 – The Need for Change. I’ve mentioned navigation tags in a previous post. I am very excited about this concept as a cutting edge offensive tool. In addition, he provides offensive axioms. If you make sure your game plan and design fits these axioms, you will definitely increase your offense’s chance for success. Finally, Gonzalez expands beyond what has become the go to packaged play for a lot of teams – stick/draw. He includes video and details on stick draw, as well as two other packaged plays which are simple to implement. As he has done before, Dan Gonzalez has created a powerful resource for you coaching library. Get Dan’s book on your iPad or Mac. 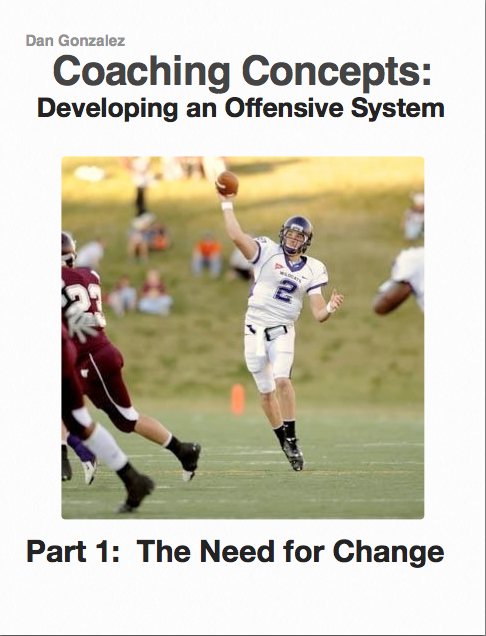 Coaching Concepts: Developing an Offensive System Part 1 – The Need for Change. This is a quick post, but I am so excited about what Dan Gonzalez has put together in his new book Coaching Concepts: Developing an Offensive System Part 1 – The Need for Change. The idea I am in love with are what Dan has created in “navigation tags.” Navigation tags allow the quarterback to be in sync with the play caller on a down by down basis. What was once something that was 100% memorization of the game plan so the QB was on the same play with the coach can easily be seen from the press box and communicated with Dan’s navigation tag system. Further more, think of how an offense becomes limited when the number two quarterback has to play. He isn’t as confident because he lacks experience, and most time the coach shares that lack of confidence. Navigation tags eliminate that worry be giving the coach the ability to direct his passer. Check it out. There’s not many things that are easy to add once the season has started, but this is definitely a cutting edge tool that can be added now to any passing game regardless of its structure. The best part is that Dan’s interactive book Is an easy read and loaded with video and dynamic content.